Team Mom sent us a couple of great books to review recently: Higher! Higher! and Baby Happy Baby Sad. 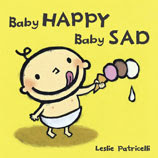 Leslie Patricelli is the author and illustrator of both books, as well as seven other titles featuring her inimitable bald baby and pigtailed little girl. Her writing style is very simple with a few well-chosen words underscoring the narrative. Her illustrations are bold and graphic with a lovely textural quality, it's hard to tell if they're drawn or painted. I love the colors, they're bright and cheerful but not screamingly so. Higher! Higher! is a hardbound picture book that tells the story of a little girl being pushed on a swing by her daddy. Parents will be familiar with the refrain of its title! As she is pushed higher and higher, she soars above roofs and mountaintops and beyond, finally coming back to earth and wanting to do it over again. Higher! Higher! is absolutely charming and, of course, reminded me instantly of my own daredevil girl. 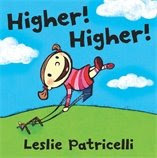 Check out all of Leslie Patricelli's books at Candlewick Press. Those are cute books...I love the simple graphics and the themes. These books are adorable. Maybe I will consider them for JUNE reading month.